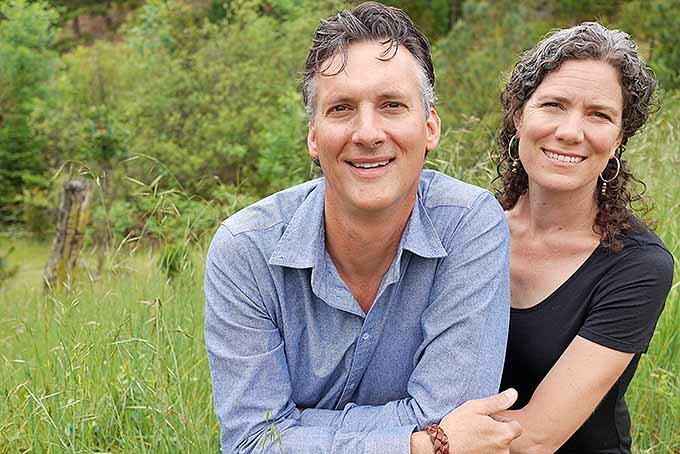 Plus more on the Shockeys’ book tour, life on a homestead in the Pacific Northwest, and what got them into fermenting in the first place. 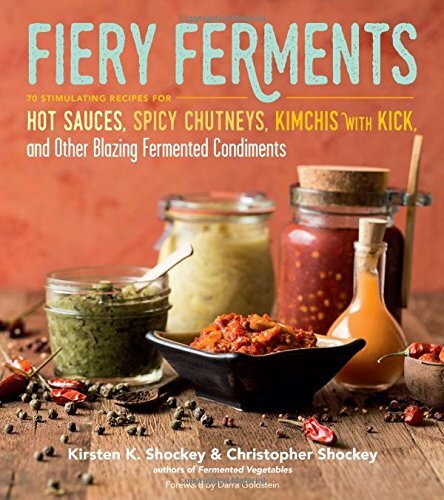 Allison Sidhu: So, today I’m speaking with Kirsten and Christopher Shockey, authors of the book Fermented Vegetables, and they’re here today with a new cookbook called Fiery Ferments that takes us deep into the world of spicy, fermented condiments. 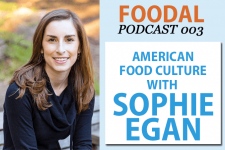 So, Kirsten, Christopher – welcome to the Foodal podcast. 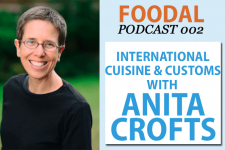 Allison: So, tell me, how did you first get into fermenting foods? Christopher: You tell the story. Kirsten: So, about 1999, under our Christmas tree there was a big, big box and when we went to pick up the box my mom said, “Oh wait, be careful with that.” And what it was was a crock, one of the antique crocks with a little lid that she bought and started our first sauerkraut in for us to get started with us. So that was the first one, and you can image the four children who were little at the time peering into this stinky box going, “What [Laughter] is this?!”. Kirsten: So yeah, that was our start and for many years that’s all we did was just you know, pretty much basic sauerkrauts. And in 2009 we started a small farmstead fermentation company and we knew it was sauerkraut again mostly to begin with, but we started at the wrong time of year – winter – when we were just ending with the local seasonal cabbages. And our friend who has an organic farm down the road would call me up and say things like, “Hey, we have way too many parsnips. Can you ferment them?” and I didn’t know. And I’d go to the internet and 2009 is not that long ago, but there was nothing out there. [Laughter] And so yeah, I would find nothing that said it would kill us. 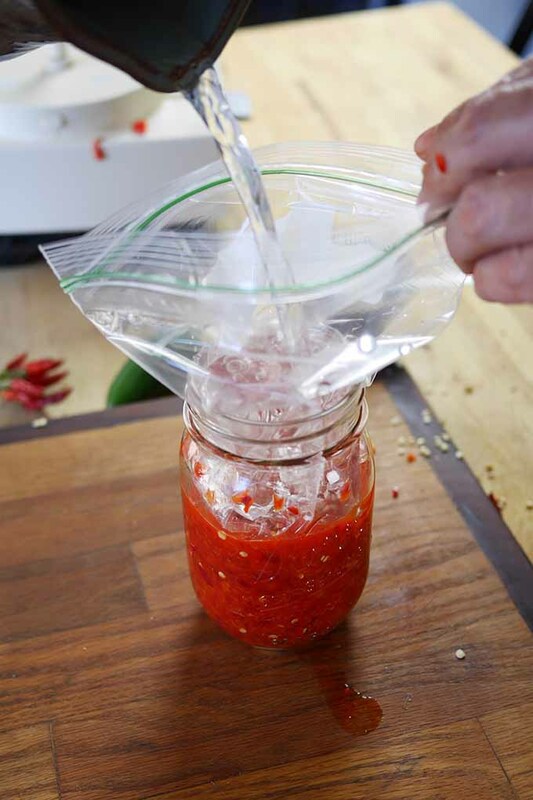 Homemade lacto-fermented sriracha. Excerpted from Fiery Ferments © 2017 by Kristen Shockey and Christopher Shockey. Photos by © Lara Ferroni. Used with permission from Storey Publishing. Kirsten: So then I figured well, we’ll try it. And that ended up being the fun part of the business was just creating the recipes and having new things at market. And when it came to the idea of just picking, you know, three or four product lines and making the same thing all the time, it felt less fun. And also, teaching people was a lot of fun. Christopher: And you know, it was supposed to be just a short-term thing. I trained as a cider maker and so our idea – we tried to make the farm pay for itself, like most homesteaders. We planted a lot of heirloom cider apples and pears, and we were going to make hard cider. And so we were waiting for the trees to grow up, and so you know, from a business perspective, Kirsten made great sauerkrauts. And so we thought well, we’ll just do this for a couple of years until the apples come in and then we’ll switch to hard cider. And unfortunately, the cider business was a lot more work than I thought it was – I’m kind of a lazy farmer – and so we just kept bottling or jarring more and more sauerkraut and kimchis and getting into more and more flavors. Allison: Yeah. And I know you mentioned that this started out as a small business, but I know that your actual homestead is about 40 acres and you’re based in southern Oregon, right? So, you’re dealing with the climate up there and the local foods that are particular to your region. Allison: Yeah. 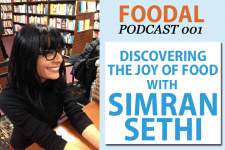 I was really interested too – I mean, I guess the whole reason why you have your last book and this book that will be coming out around the same time as the release of this episode was that you really transitioned as you started to learn more and more about fermenting into what developed into this great passion for teaching. 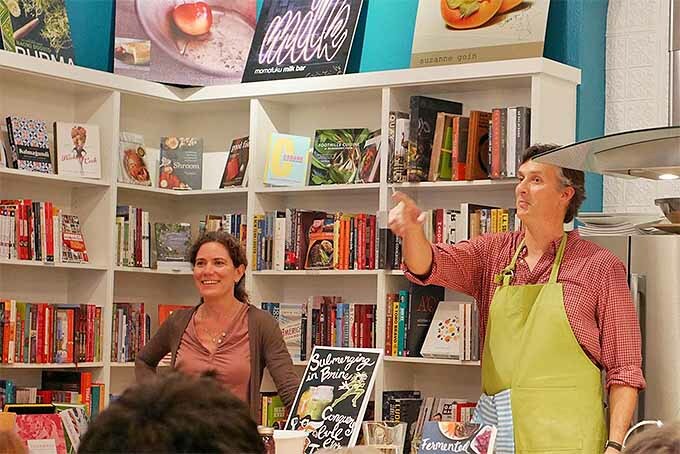 And I know that you also host workshops and you’re just really passionate about getting other people into fermenting. 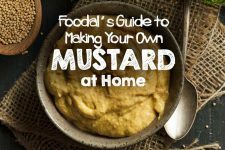 So, what is it about fermented foods that really struck you, and why is it so important that we eat them and start making them, you know, at home ourselves? 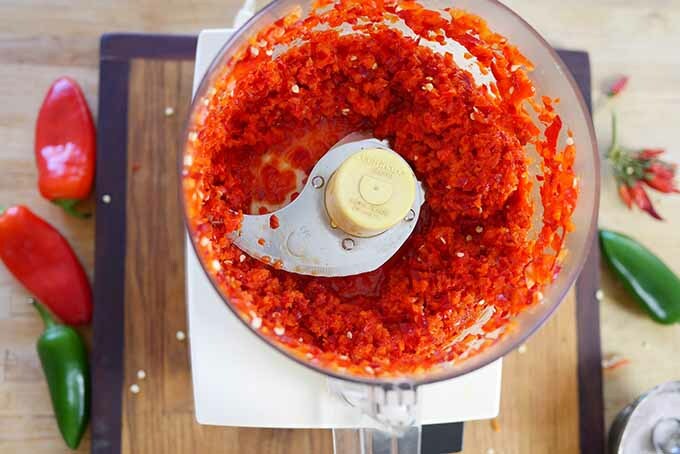 Preparing a pepper mash in the food processor. Excerpted from Fiery Ferments © 2017 by Kristen Shockey and Christopher Shockey. Photos by © Lara Ferroni. Used with permission from Storey Publishing. But, often once they did taste it they were shocked. You know, this isn’t the canned stuff. And then they would buy one and be back the next week because it made them feel better, you know? They suddenly realized, wow, I don’t know what it is about this food but I feel brighter after I eat it. And of course with that, you know, our little jars were eight dollars, and you know, there’s people that had big gardens and they wanted to make their own. And so we really became, you know, sometimes I imagined us looking like the little helpdesk from Lucy and the Peanuts. 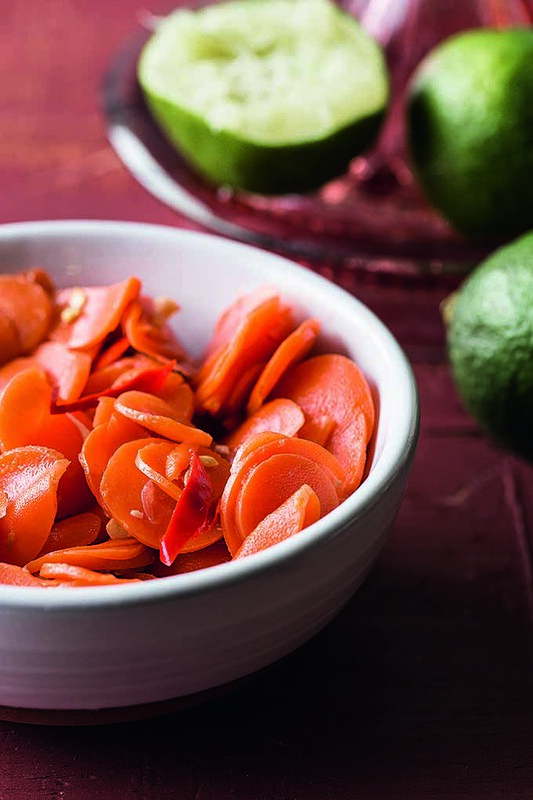 Spicy carrot lime salad. Excerpted from Fiery Ferments © 2017 by Kristen Shockey and Christopher Shockey. Photos by © Lara Ferroni. Used with permission from Storey Publishing. Kirsten: Fermentation helpdesk, because people would come to us and maybe buy a jar or not, but I spent so much of the time just, just talking people through it. You know, again this is 2009/2010, it wasn’t all over the news yet. And so, it was people’s absolute desire to understand what was going on, I think, that pushed us. Christopher: Yeah, and we saw, during that time we would see people that would come in and say, “My doctor said I had to eat probiotics. Is this stuff the stuff I’m supposed to be eating?” You know, which isn’t a great place to start with flavor. And so we knew that flavor was the key, that people would get healthier if they were eating it, if they found flavors that they enjoyed, not just plain sauerkraut. And so, those 52 varieties that Kirsten came up with over those two years, there would be some flavor that someone would taste during one of those Saturday markets, and then they’d come back and they’d be disappointed because that flavor had gone away and we were off to new flavors. And so, we started passing out recipes to people just to – so that they could make it for themselves. 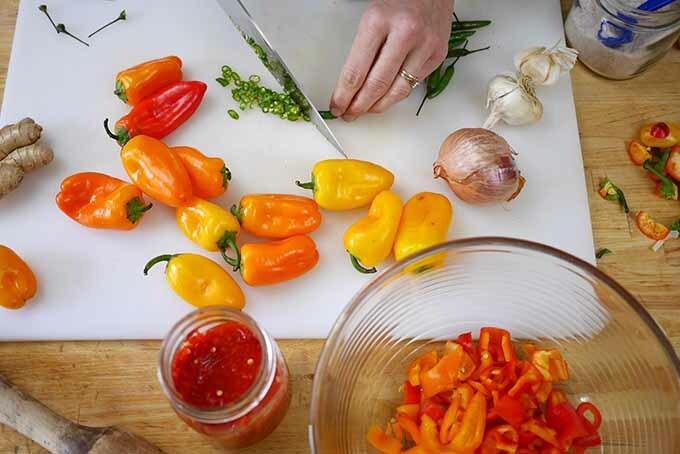 Pickled carrot-stuffed jalapenos make a flavorful addition to a savory meal. Photo by Kirsten Shockey. Christopher: And so we had sneaky recipes for the women, you know, for them to move out of the jar and for the husbands to quit thinking they were crazy, so they would hook them and then they were buying more, so it was a clever plot on our side. Allison: Right. Sounds like a genius plan. So, you mentioned flavor, and to me, I mean, this was my favorite part of the book. And obviously, in a cookbook, you do expect to be finding things that present good flavors, but like you said, some people are into fermented foods for a whole variety of reasons and I think unfortunately when we think of our health we don’t always put flavor first. A lot of people aren’t really familiar with that concept. 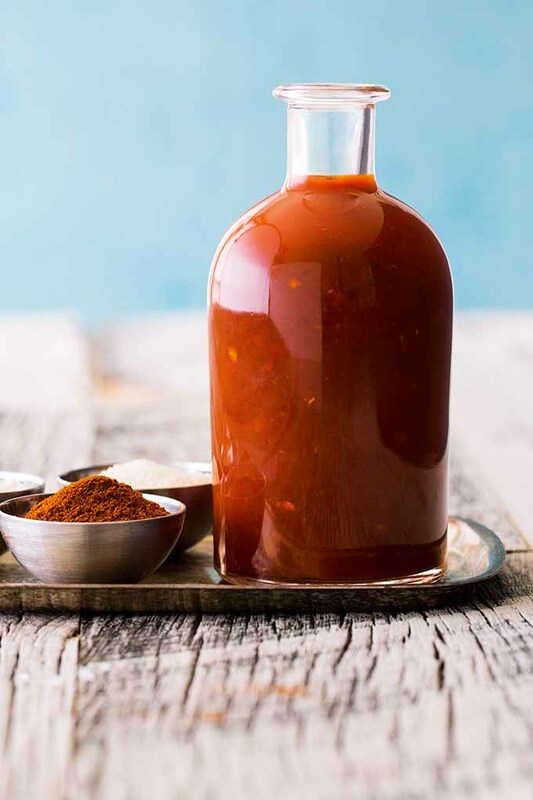 But I like how, you know, this book focuses on spice and hot flavors but you mention that you want people to really be able to taste what’s in there and enjoy them, to not just be overwhelmed with this heat. And there’s a whole range of spice levels. 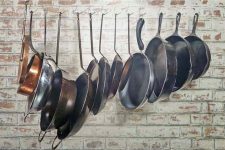 You kind of rank your recipes but you also encourage people to adapt and make them their own, try different things. So, what are some of your favorite flavor combinations in the book? And at the same time, why did you choose to focus in this book on bringing the heat to your audience? Christopher: I’m glad that you picked up on that because we did, and you know, it’s called Fiery Ferments, and there are some hot recipes in there. 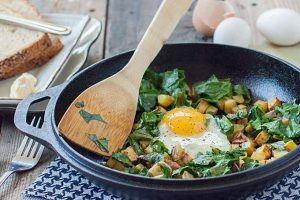 But we wanted it to be approachable to anyone so we really worked on – most of the recipes will have variations where you can really dial it down. Or if they’re fairly low on the heat scale, dial it up. And we wanted that because if you find a flavor that you really enjoy, the next step is to get the heat just right, like you said. I don’t think it’s fun to not be able to feel my tongue or the inside of my mouth, and especially when you get that hint of flavor and then the burns comes and you can’t experience it. So, I think that’s the beauty of doing it this way is you can turn it up and down, depending on where your flavor – where your heat index is. Kirsten: So, you asked what some of my favorites are. There’s a really simple recipe in the book that is, I think I call it a green chili starter or something [Editor’s Note: this recipe is called Fermented Green Chili Base in the book]. And that one is just three different types of peppers, and some onions, and we make a big batch when the peppers are ready in the garden because then I’ve got these fresh, vibrant, alive peppers that have big flavor that I can use sort of as instant food, I mean, like convenience food, the rest of the winter. And just throw it in a chili at the end of the cook cycle so that you’re still getting some of that probiotic but you’re also getting that, you know, that deep, fresh, chili flavor. So for me, that’s one of my favorites. Prepping peppers to ferment. Photo by Kirsten Shockey. Christopher: I like – so, disclaimer: we’re in the Pacific Northwest, and its gray here a lot, so coffee is one of the food groups for everyone. But there’s a coffee sauce in there, and I love it because what people don’t know is how many different passes we took trying to get coffee infused into a, you know, a hot sauce. It was a great idea but then figuring out – do we dump beans, do we pour coffee in, do we try grinds? And so, in the lab, we just had so much, so much fun trying to bring these two tastes together, you know, into one hot sauce. And it’s wonderful because you can get that hint of coffee taste in there. I love that one, I love the Hawaiian chili pepper water because I had that when on some trips out to Hawaii and I can just see the bottle on the table that’s really bright, you can see those peppers in the bottle and it’s just easy to slather that on anything really quick. Allison: All of those sound delicious. 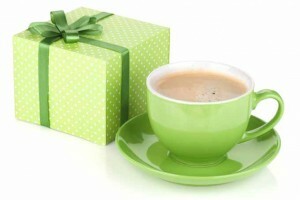 I love the coffee combination especially. 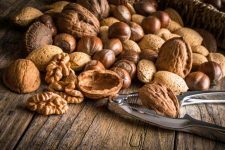 In a past interview on the podcast we talked about all different kinds of fermented foods, and people often forget or they might not even realize that, you know, coffee and chocolate as well, those are fermented foods too. 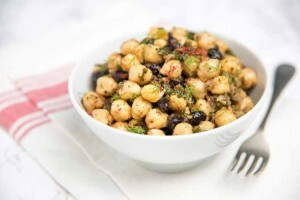 And I like how you combine those sweet and spicy and earthy flavors in different recipes. One of my favorite parts of the book is the chapter towards the end on drinks and desserts which I think, you know, especially when thinking of fermented foods in particular, and things you can make yourself at home, that’s not the first thing that comes to mind for a lot of people. [Laughter] Yeah, tell me a little more about that. Kirsten: That was a fun chapter. Yeah, there’s a chocolate-cranberry mole in there that is just such a surprise. A. Because you’re actually eating raw – well they’re fermented so the process, you know, kind of cooks them in a microbial way – but you’re eating raw cranberries, which people don’t think of doing. Eating cranberries without dumping a bunch of sugar on them. And so, they’re not as sour and the chocolate in there is – just comes across beautifully. And then there’s, it’s not a strong chili, the type that we use in the recipe. And so, yeah, it’s just, it just works. And so, of course, you think of hot sauce desserts, you think of ice cream. So, we put that over a really rich vanilla ice cream and that’s really nice. But, I think one of my other favorites is the pineapple habanero sauce. Kirsten: Habaneros, for people that like heat, they have a really interesting thing that I noticed is they – you start out, you taste it, you taste it, and you think, “Oh, this wasn’t so hot” before they slam you. [Laughter] With the pineapple it’s just really, it’s really great, and you can just have the pineapple reduction and put the tiniest bit of sauce in there and you get this wonderful sparkle of heat, but it doesn’t knock you out. It’s a good way to use habaneros. 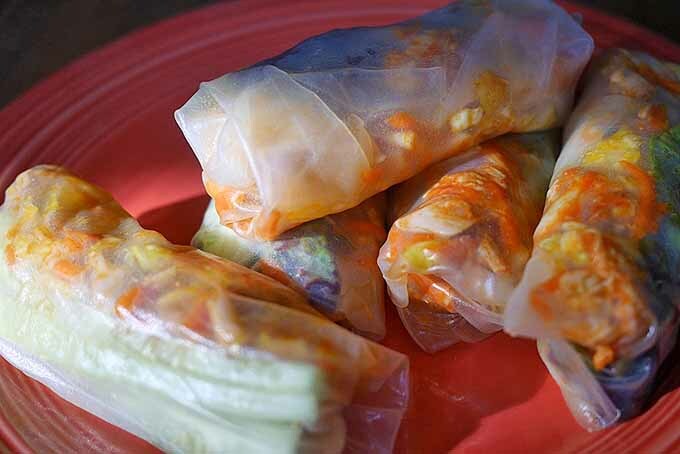 Gochujang in homemade spring rolls. Photo by Christopher Shockey. 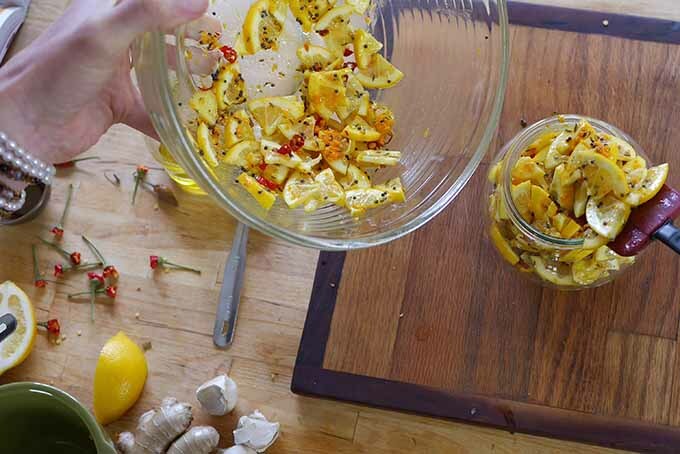 A few times you mentioned peppers in a bunch of these recipes. 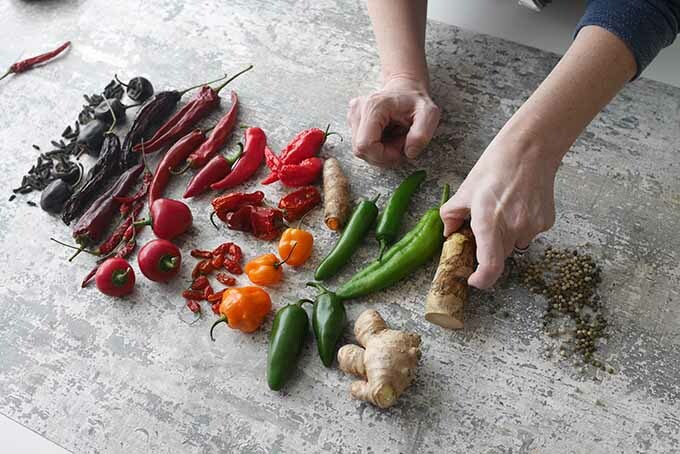 But to backtrack a little bit, you actually begin the book by tracking kind of the history of spice, at least spice that gives you that fiery heat, around the world. 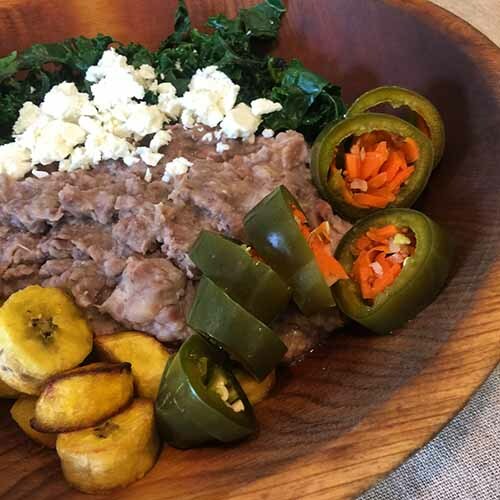 And you talk about a lot of different ingredients that can bring that other than the chili pepper, which you’ve incorporated into a lot of your recipes, or you feature recipes that come from all different culinary traditions. And historic recipes as well. What kind of led you to exploring, you know, ferments in this category other than the chili pepper? Kirsten: Well, we knew that so many of the hot sauces that people love come from the Asian tradition. You know, the European tradition doesn’t have as much heat. And yet, we also knew that the peppers were from South America. So, before Columbus stumbled onto them looking for black pepper in India, all of Asia didn’t have hot sauce either, or hot peppers. Kirsten: And so, that was sort of an interesting question for us to try to answer was, okay, these cultures clearly love superhot foods. And so, what did they do before they fell in love with the chili pepper? Kirsten: Because they have quite a love affair with the chili pepper. And so, that was really fun and fascinating to find out. And it was things like, you know, ginger root and lots of garlic. 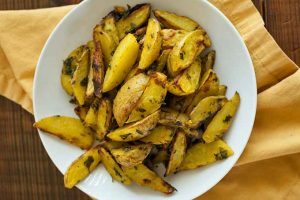 And some of the relatives of ginger root, galangal and turmeric, which, we don’t think of turmeric as very hot, or even ginger and galangal, but when you use enough of it, you know, you’re going to get a pretty good burn. Kirsten: And then they did, like in Thailand, they did use galangal and green peppercorns because peppercorns grow there, so they’d pick them when they were green and that was sort of the precursor to some of the Thai curries that we know so well now. Christopher: So, we would usually do a deep dive. Well, for example, we’re working on a book now and so, the way that it divides up is, I do a deep dive looking back at, you know, in old cookbooks from way back. And it was just fascinating to think about this Thai food that we – was so characteristic with chili before that being something else. And so, you would just get snippets of what foods taste like or what might have been included but there were no recipes. So, once we knew what they were using as heat then it was up to mostly Kirsten to figure out okay, so how would that have likely been done. Because there just weren’t any fermentation recipes about that, but we knew that they used fermentation to preserve it. So there was a lot of historical kind of fact finding, and then imagining what that must have been like. So I think a lot of the recipes, especially the non-chili ones, are pretty unique. I don’t think they exist anywhere else probably, because I don’t know anyone crazy enough to try to go back [Laughter] and figure things out. Kirsten: So you’re saying it’s historical fiction. 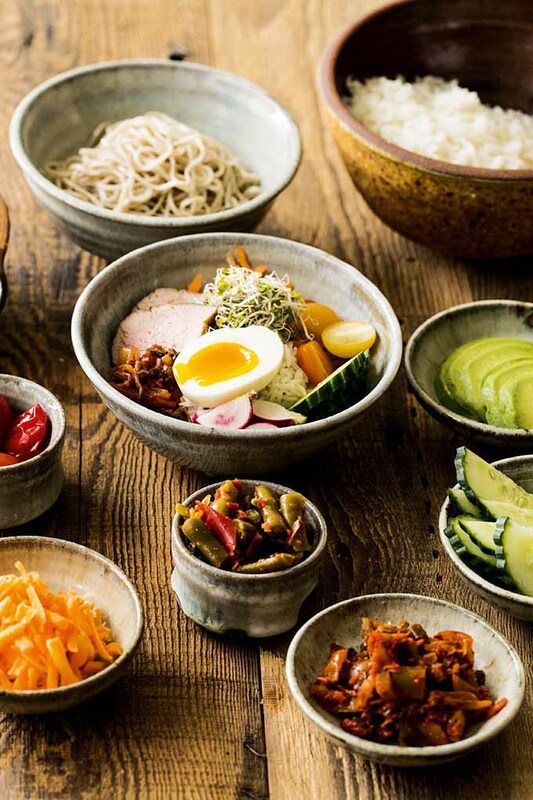 Build a bowl with delicious spicy condiments. Excerpted from Fiery Ferments © 2017 by Kristen Shockey and Christopher Shockey. Photos by © Lara Ferroni. Used with permission from Storey Publishing. Allison: In a way. I love that you’ve created your own story though, of fermentation, which is exactly why people keep coming back to you. So, awesome. Well, I think the next phase is kind of – for people who have done this before, they will definitely be excited for your book. 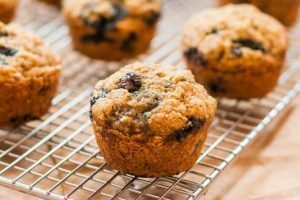 But for the beginners, I want to talk a little bit about the actual process of making these recipes because it can be a little scary to think about diving right in. You know, you might need special containers, the process involves combining these ingredients in a certain type of environment, and waiting while this helpful bacteria does its work, right? And you’re hoping to get a delicious sauce at the end, but I think a lot of people might go, “Whoa, that’s a lot of work,” or they’ll say, “Bacteria? I don’t know, it sounds like something could go wrong.” So, what’s your advice for people who might be a little scared to try this for the first time? And why is it really something that, you know, we should really all be doing, we shouldn’t be afraid to get started? Kirsten: Well I mean I, I get that. We did grow up for generations now with germ theory. Kirsten: So the idea of leaving something out of your refrigerator, on purpose, and then sticking your fork in it, and then putting it in your mouth, it’s just counterintuitive for where, where we’ve all grown up. And so, you know, for a lot of people that’s really the first step, it’s just getting past that part. The cool thing is that nobody has died from fermented vegetables. Kirsten: Lactofermentation is actually super safe. It’s so safe that a fermented vegetable can’t have pathogens like E. coli or some of the things that your fresh vegetables can have. So in places around the world that have unhygienic conditions, it’s actually a way to make the food safer. So, the first thing to get out of the way for people that are, who are afraid to kill their family, death by fermentation, they can’t do it. Excerpted from Fiery Ferments © 2017 by Kristen Shockey and Christopher Shockey. Photos by © Lara Ferroni. Used with permission from Storey Publishing. Kirsten: And so, that’s really nice. It’s really clear. When it’s right, it’s wonderful and pickle-y, and you can smell the acidity, and if it’s bad it’s, you know, worse than your compost pile. So, that speaks to sort of the bacteria part of your question. Christopher, do you want to take the how-to part? Christopher: Well, especially for this book it, it’s pretty easy doing the master recipes because we start out with just those simple master recipes and then we get into variations. But, you know, you really don’t need a lot of tools to do this work. Cuisinart, or you know, some kinds of food processors are awfully handy, but we’ve done a lot of things just by hand as well. Christopher: You need salt and water and the peppers themselves basically, and a container. We also try it, and especially for folks who want to experiment, they want to start with a small jar. You know, they don’t want to start out with a gallon of something. Whether they are going to eat it or not, they’re not sure. So, we do very small recipes too, just to try it out and find something that you like. Christopher: Yeah, if you think about it, it’s kind of cool. It’s the new Tupperware. You just – everybody brings vegetables or in this case, brings chilis, and you stink up one person’s house instead of six people’s houses and you have a lot of fun doing it. And people can try different things, and so it can be kind of a fun thing. 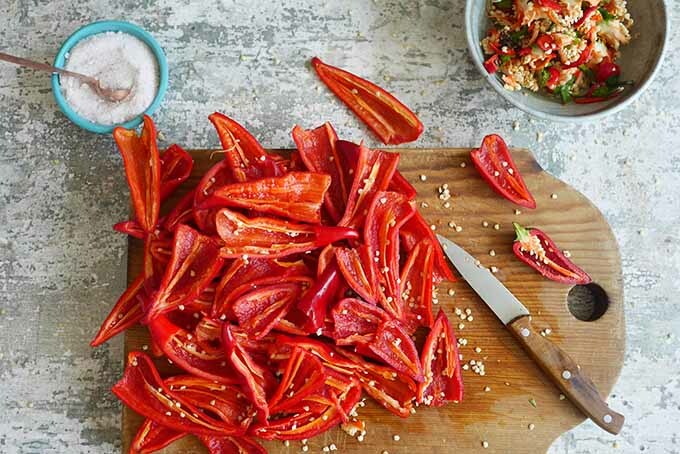 We’ve had groups of people, twelve people wielding chef’s knives at one time with all the pepper and capsicum in the air and it just gets you, gets you laughing and crying all at the same time. It’s kind of fun. 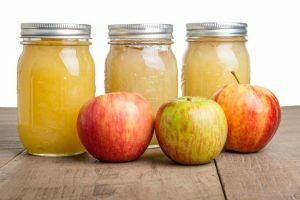 Allison: Yeah, I think that sounds great because so many people today want to get into home canning and preserving and fermenting, but they might live on their own or they don’t have, you know, many children on the farm or enough people to really eat a giant batch of whatever they make. So being able to share it and then swap with everyone else who’s trying their own thing sounds lovely. I would love to do that. Kirsten: It’s – the social, it makes everybody feel more comfortable with what they’re doing because they can bounce off each other like, “Okay,” [Laughter] “I get this now, I see what you’re doing,” or whatever, you know. And like you said, swapping out the flavors, then everybody walks away with, you know, six small jars of a very different condiment. Allison: Definitely sounds like the next big foodie event project. I’m sure everyone will be doing this in time, in time for the holidays if they’re not doing it already. Allison: Yeah, it sounds perfect! I do a cookie exchange with my own family, so we’ll have to do this next. I’ll have to get them all on board. So, I actually had a question. I know a lot of these recipes, you don’t actually add water to them. 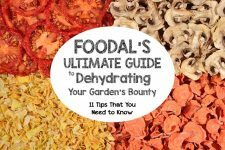 Whether you’re making a kimchi or a sauce, a lot of times the vegetables will release their own liquid to kind of form the brine that you are going for to keep your ingredients submerged in. But I know you mention that if you do need to add water to a recipe, we might not just want to add tap water to do this. Is there something special that people need to keep in mind in terms of the water that they might be using? Kirsten: Yeah, you know, ferments have worked with chlorinated water, but it’s an extra thing that might cause a problem if it’s heavily chlorinated. And so we suggest that you use unchlorinated water, which you know, generally is going to be either bottled water, or if you have a filter that takes out the chlorine, that’s great. It used to be that municipalities just put regular chlorine in the water and you could set a jar out of water overnight and it would dissipate. But now some are using a different form, which is called chloramine, and it doesn’t dissipate out of the water. So, we suggest that you use, you know, a water that you’re pretty sure is unchlorinated. Kirsten: Right. And most of the ferments in this book are actually what we call dry fermenting. Kirsten: And it’s a funny word to use, but the reason we call it dry is because we are not adding water. And, so things like pickles or, you know, chunks of vegetables where you’ve got big, big vegetables, you’re going to add a brine which is the water and salt. 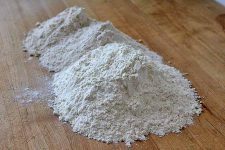 But most of the recipes, you add the salt, and then that pulls the water out of the vegetable, and those are the dry brines. 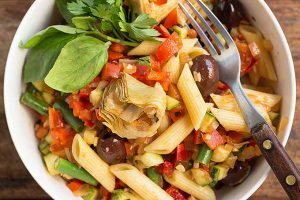 And we prefer that because it’s such a rich flavor, because you’re using the vegetables’ own juices to create the moisture that you need for the ferment. 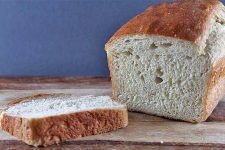 In this book, you know, people that have just made sauerkraut – sauerkraut is cabbage and cabbage releases, usually, gobs of water, and so they’re used to these big layers of brine on top of their cabbage. So some of the recipes in this book like, you know, there’s a ginger paste in there or some of these pastes really don’t have – or the chocolate mole we even talked about – don’t have a visible brine layer. Kirsten: But we explain in the book, and I’ll explain here, that it’s fine. As long as you have enough brine that everything is wet, the oxygen is all out and you know you can weight it down either with like a plastic bag filled with water – it’s that simple – then it’s good. It’s just enough to keep the environment anaerobic. And that’s the key, is the anaerobic environment. Demonstrating the water bag weight technique. Excerpted from Fiery Ferments © 2017 by Kristen Shockey and Christopher Shockey. Photos by © Lara Ferroni. Used with permission from Storey Publishing. Allison: Right, and I’m glad you said that because I think that’s something else that maybe people have worked with different kinds of pickles that aren’t actually fermented. So they don’t really completely understand the idea of that anaerobic environment where you want to keep everything underneath that brine to prevent, you know, the molds and yeasts that you don’t want from getting in, right? Kirsten: Right, exactly. And that’s a good thing that you’re bringing up. So, the word “pickle” is kind of a little bit misunderstood and you’re right, people do think that a vinegar pickle might be the same as a lacto-fermented pickle. And the definition of pickling is to acidify something, and with a vinegar pickle what you’re doing is you’re acidifying your vegetable or whatever you’re pickling by throwing an acid on the top of it. So, in the case of most of it, it’s vinegar, or lemon juice or something like that. With lacto-fermentation pickling, what you’re doing is you’re putting in that salt water, you’re creating this perfect environment for the lactobacillus that are already there and on the vegetables to start doing what they do, which is multiplying and eating starches and sugars and breaking it down. And as they do that they create, you know, they off-gas some CO2 and create that acidic environment. And they can do that – they need to do that all anaerobically. And the other things like you said, molds and whatnot, they need the oxygen, so. Making lemon achar. Excerpted from Fiery Ferments © 2017 by Kristen Shockey and Christopher Shockey. Photos by © Lara Ferroni. Used with permission from Storey Publishing. Allison: Right. And during that off-gassing process, people are going to notice some, some fizzing and bubbling and might have to “burp” their containers, right? 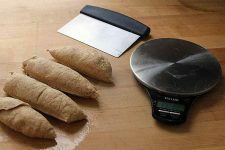 I know for someone who might be familiar with something like, you know, tending to a sourdough starter and they know they need to keep track of its activity and make sure they feed it and keep it happy, that’s kind of a similar process to the idea of keeping an eye on a ferment. Would you agree? Christopher: Yeah, just without the, the feeding. We do a lot of sourdough around here too, and they’re more needy, you know, because they’ve processed the flour and the water, and they need that again, to be tended to. 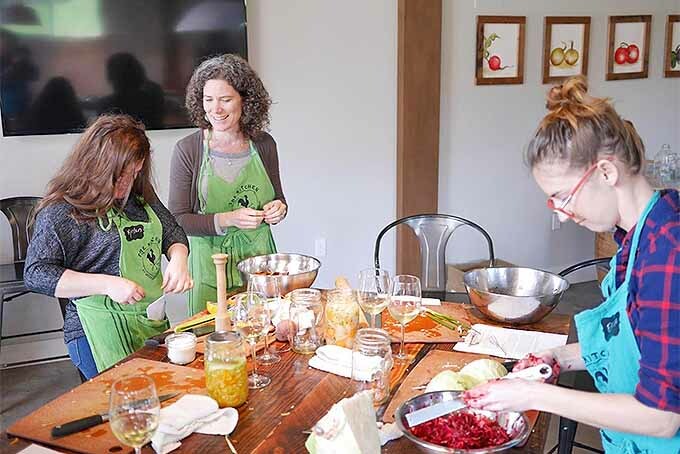 Whereas with the ferments, everything is done and what you are really doing is, on the burping – you know when we teach, we teach little kids how to make ferments and this is their favorite part. Because you know, for the kids, they start out and we’ll say, “Hey, how many people like pickles?” and maybe we’ll have a few brave kids that’ll raise their hands. These are like fourth graders, third graders. Allison: That was me. I loved it as a kid, so I understand. Christopher: Yeah, and everyone looks at you like, “Oh, who is this woman! ?” or girl. Kirsten: Who is this kid? Allison: Aw, but why not? Kirsten: He always does and the adults love it. Christopher: And then people come to me and say, “Christopher, the fart thing is – I finally understand the CO2. Thank you, that was, that was good!” And it’s like okay, I know. I know. Christopher: So that’s, that’s really what you’re doing, is the CO2 gets built up. And we’ve had some, Allison, like when we’re on a book tour and we’re ten days out and we’re making new hot sauces and kimchis at each stop, and they’re all in the back of our Jetta. If – we’ll go to a parking lot and take these things out and the lids are starting to bow because it’s in a warm environment, so they’re creating a lot of CO2. 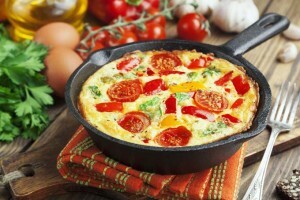 But typically, you know, in your kitchen, especially in a cooler climate, it’s really very little that you have to do. Yeah, every now and then it’s kind of fun to open the lid and make sure the CO2 is out, but it’s not really a dangerous thing at all. Versus people that have done more of, you know, fruit-based ferments that really create a lot of CO2, with the vegetables it’s not as much, And it’s just easy, very easy to take care of versus fruit based drinks or you know, if people are making their own ginger bugs. They’re a pretty easy tenant. Allison: Sounds like fun. 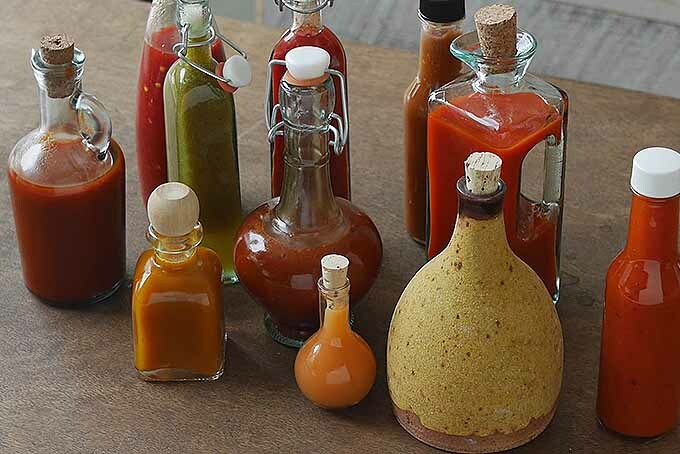 So, I guess my next question is, and it might be hard to answer – but what’s something that you haven’t tried that you’d love to experiment with fermenting or maybe even a spicy ferment that didn’t make it into the book that you’re still working on? Kirsten: Oh. [Laughter] That’s a good one! [Laughter] I mean there were a few things that didn’t make it into the book because they just didn’t taste good. Allison: Yeah, and that, that makes sense, sure. 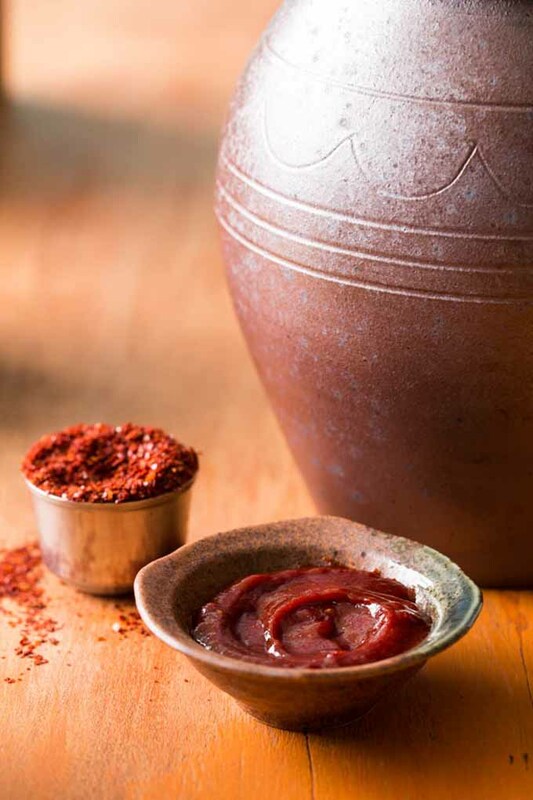 Spicy gochujang. Excerpted from Fiery Ferments © 2017 by Kristen Shockey and Christopher Shockey. Photos by © Lara Ferroni. Used with permission from Storey Publishing. Allison: I think that’s an important point though, that even for you guys, sometimes a batch doesn’t work and you try something else the next time. So you have to be – you can’t be afraid to experiment with this kind of hobby or activity. Christopher: Oh, good lord. So, we’re working on a third book right now. Christopher: That’s – if they did, then the villagers went out that day to work in the fields and then they came back at night and everything was fine. So, you know, I think for the first book and for the second book we had the same – not that dramatic, but we had, you know, I think mushrooms in the first book took us awhile to really dial in, to figure that out. And the second book I think getting to know those non-chili trends, you know, like dialing in how much green pepper and how does green pepper versus black pepper versus white pepper play with each other. There’s so many iterations that have to take place before you see a recipe in a book. Especially these things that get invented. So, when you ask that question I’m just thinking of all the ones that weren’t quite right and we said, okay. And it takes awhile, you know, for some of these. Like gochujang, it’s a six month sometimes fermentation so we did nine varieties of that. 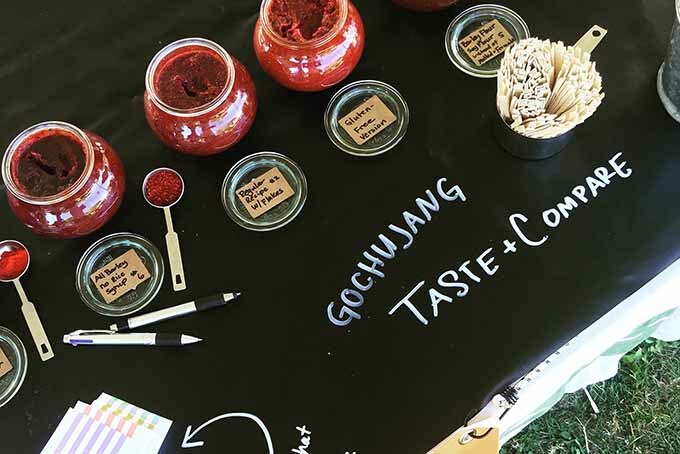 Gochujang tasting. Excerpted from Fiery Ferments © 2017 by Kristen Shockey and Christopher Shockey. Photos by © Lara Ferroni. Used with permission from Storey Publishing. Christopher: Because we knew we had – I mean, we had to turn in the book, we couldn’t afford a second run. And so, we just had to try all kinds of different varieties hoping that we would hit a winner in that. So sometimes you just have – we have, Allison, we have an entire refrigerator full of hot ferments. Christopher: And it takes a lot to eat all that, you know. Kirsten: I think while he was talking I realized too that – as far as something we haven’t tried and that I do want to play around with is – we went to Myanmar this winter and that was – it was really fantastic to see their ferments and stuff that they’re doing there that are very traditional still. Kirsten: We’ve tried. You know, their fermented tea leaves and their fermented tea leaf salad. So that’s something I want to play with and just see if you can do it with dried green tea and bring it back to a moisture content that you could ferment. And then the other thing they do is that they put a lot of – like everything has shrimp paste or shrimp powder in it. And for me, working with the seafoods has been something I’ve shied away from. Allison: Right, right. It sounds like you have your work cut out for you, but at least you’re excited to try everything. The green tea sounds the most interesting to me, but I can’t join you on the shrimp. Unfortunately, I found out recently that I have a shrimp allergy, so I’ve been figuring out how to deal with that. So some people have to be very careful with that. But you’re right, it’s very pungent and I think the fermentation of, when you get more into the proteins and the drinkable dairy, that’s its own whole exciting field, so. Christopher: Mmhmm. There’s so much to explore, Allison. Kirsten: Well and the proteins, I mean, the reason the Southeast Asian cultures add that, is you know, a little bit of shrimp then in a ferment. Or like kimchi, you know, that does have the shrimp or the fish in it, you now have this complete food because you’ve got the amino acids on board. And so, that’s why adding the proteins to these lacto-fermented vegetables is such an interesting idea as far as just nutritionally what’s going on. Allison: Yeah. And you bring out these flavors that you can’t really get any other way, so that’s probably the most exciting thing to me. Allison: Yeah. 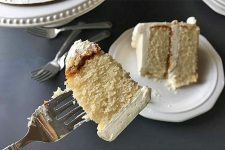 So, I know I’m excited to share one of your recipes with our readers on Foodal.com, so we’ll have a link up to that. And this book Fiery Ferments is coming out at the end of May, so when this episode is released it’ll be available on Amazon.com and elsewhere. 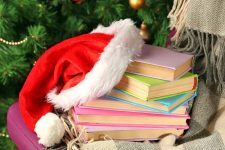 I know you’re also pairing your release with a book tour and offering workshops continually in Oregon. Can you tell me a little bit about what’s coming up? 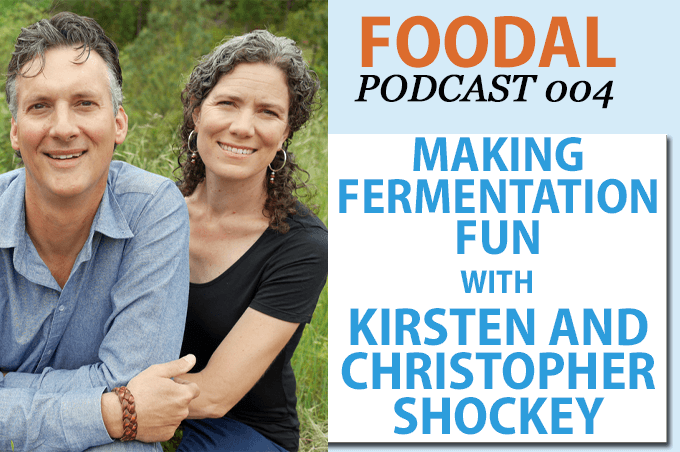 Christopher: Yeah, so for people – they can go to ferment.works. Christopher: And you know, so it’s a little more complicated. But we’ve got a Northwest tour coming up. And then Kirsten is going to be on the East Coast at least twice over the summer. And then she’s going to be in the Rocky Mountain states twice as well, mostly in the Denver area but then down into New Mexico as well. And then also we’ll be doing northern California, and now it looks like southern California too. So honestly, you know, if there’s a lot of people and they want to learn more about it they can get in contact with us and we’ll try to put something together to where we’re there for them, because this is what we love to do, is teach people how to do this. Allison: Awesome. So, you mentioned, ferment.works is the website, how else can people reach you around social media? Allison: Great. Well we will definitely include links to all of these. I definitely can’t wait to try some of your recipes and I’m sure our listeners have their mouths watering by now too. So I’ll let you go for now, but thank you so much for joining me today, it’s been great talking with both of you. Christopher: It’s been a pleasure. Kirsten: It’s been a pleasure. Thank you, Allison. 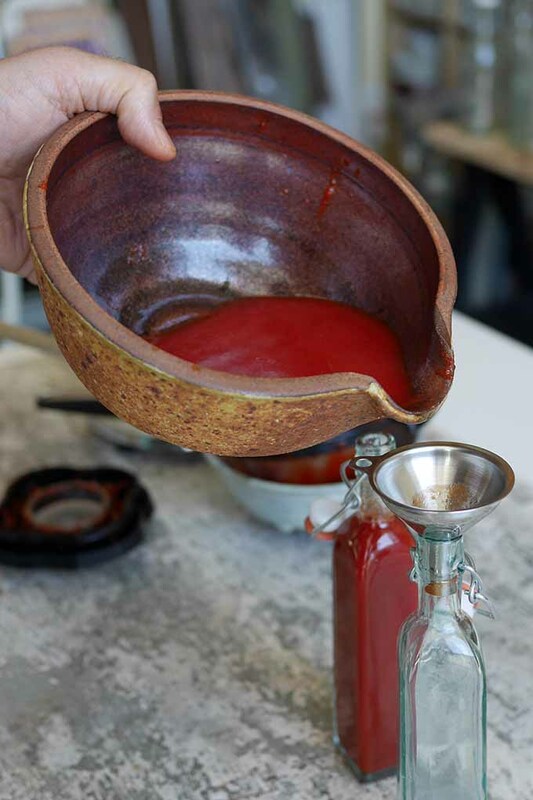 Ready to Make Your Own Hot Sauces, Chutneys, and Kimchi? Interested in sponsoring the podcast? Let’s talk! Photos by Kirsten Shockey, Christopher Shockey, Ariana Shockey, Jakob Shockey, and Lara Ferroni. Used with permission.